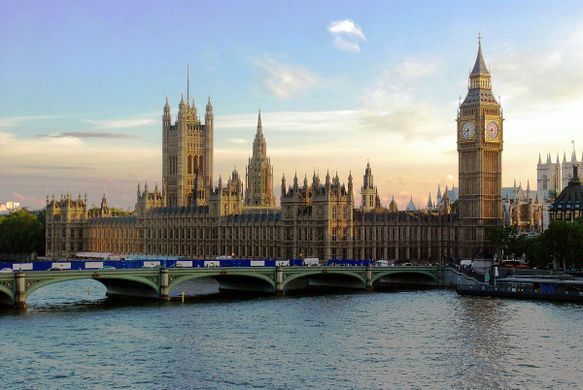 A total of 26 MPs engaged with the project and the results were extremely interesting – piquing interest from key figures who will support our aims to raise awareness of the issues surrounding indoor air quality. Those that had their offices tested now have a greater understanding of the dangers associated with ‘sick building syndrome’ and how we can all improve our health and wellbeing by making some simple behavioural changes at work – or at home. Airtopia’s tests identify common airborne triggers, including formaldehyde, found in furniture, soft furnishings and cleaning products; VOCs, emitted by paints, sprays and air fresheners; mould; and carbon dioxide, which, in high concentrations can lead to fatigue, headache and dizziness. Each of the MPs received overview results as well as a detailed report for their specific office. Below are some of the highlights from the aggregated data found across the 26 offices. The normal range for CO2is 350-600 parts per million (ppm). Physical effects of CO2exposure are often felt at 1000ppm. 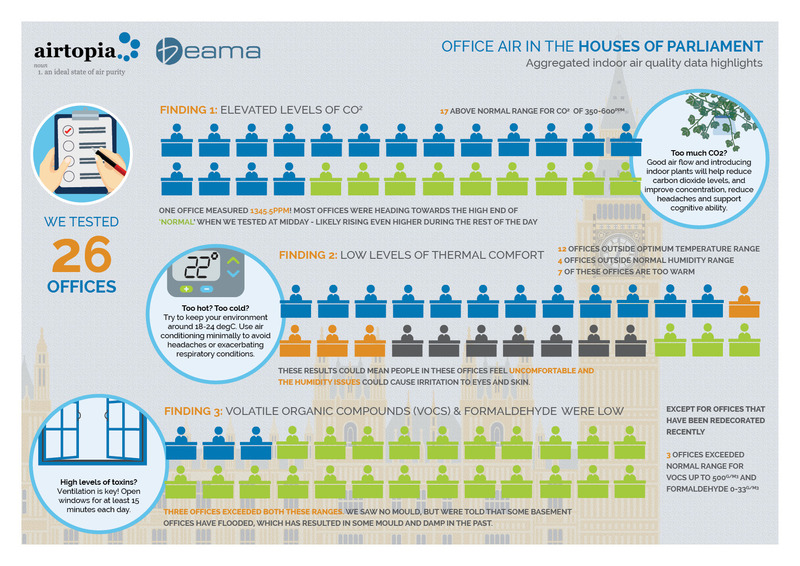 Of the 26 offices we tested, 17 were above the ‘normal’ threshold. One office measured 1345.5ppm. It’s important to note that 9 offices were above 600ppm before noon (a few were above 800) and would likely have had even higher ratings in the afternoon. The normal range for temperature is 18-24 °C and for humidity is 40-60%. We found 12 offices outside the range for temperature and 4 offices outside the normal range for humidity (though an additional 17 were at the bottom of the normal range). On a day that was warm (not hot) and overcast, 7 offices were above the normal temperature range well before noon. One area of the estate had relative humidity below normal standards, which could feel uncomfortable and cause irritation for eyes and skin. Finding Three: Volatile Organic Compounds (VOCs) and formaldehyde levels were ow, except in one area where offices have been redecorated recently. The normal range for VOCs is up to 500 µg/m³ and for formaldehyde is 0-33 µg/m³. Three offices exceeded one or both of these ranges, Though we saw no mould, we were told there are offices in the basements that have been flooded and that damp and mould are problems. Overall, we are pleased to report that no MPs or members of staff are in imminent danger! However, the various issues that we did uncover could certainly impact comfort and productivity levels.